When German electronic musician Jo Zimmermann embarked upon a solo career in 1992, like many artists, he decided to adopt a new moniker, Schlammpeitziger. Since then, Jo Zimmermann has released ten albums, which will soon become eleven with the release of Damenbartblick auf Pregnant Hill on Hamburg based Bureau B on the “19th” of January 2018. This is sure to prompt another round of people asking him what is a Schlammpeitziger? It’s a question that Jo Zimmermann has answered more times than he cares to remember over the past twenty-odd years. So much so, that if he had a Euro for every time he answered the question, he would be a rich man. However, each time, Jo Zimmermann has been asked the question he patiently explains that a Schlammpeitziger is a weatherfish that lives in the flat muddy waters of the European and Asian plains. However, this isn’t the only questing that Jo Zimmermann has been asked during his three decade solo career. Having dawned his Schlammpeitziger moniker, the man formerly known as Jo Zimmerman released his debut album Erdrauchharnschleck on cassette in 1993, on Frank Dommert’s Entenpfuhl label. It specialised in releasing music by experimental electronic artists, and was the perfect label to release the first album by Schlammpeitziger. It was the first of several albums to make good use of cheap Casio synths and composite nouns in the title. That was the case a year later, in 1994, when Master’s Cosmic Music and Schlammpeitziger released the split LP Let The Star Shine In/Burgfensterrhytmuskuckloch on the Gefriem label. This was the label that preceded A-Musik, where Schlammpeitziger would spend the majority of his career. By the time, Schlammpeitziger returned in 1996 with his third album Freundlichbaracudamelodieliedgut, interest was growing in his abstract and innovative music. Many of those who bought the album were amazed that it had been made with cheap Casio synths, which Schlammpeitziger had put to good use on his first three albums. Schlammpeitziger returned with his fourth album Spacerokkmountainrutschquartier in 1997. By then, his music continued to evolve and moving in the direction of IDM. With each album, the chameleon like Schlammpeitziger’s music headed in new directions. That was no surprise. 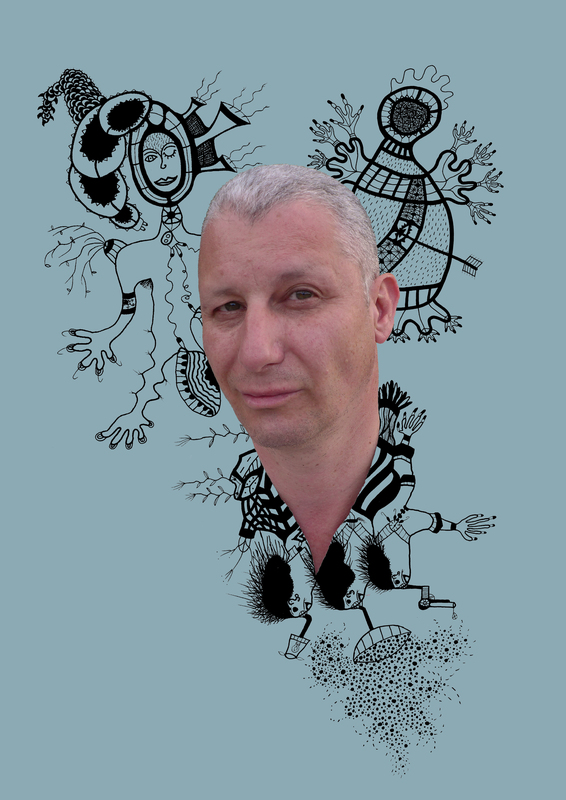 Those who have met Schlammpeitziger describe him as enthusiastic and intelligent man who has a passion not just for music, but also for his incredibly detailed paintings. They’re often tinged with humour, but other times, can be complex or used to simplify a subject. These paintings are sometimes influenced by real life events, but other times, detail Schlammpeitziger’s perception. When that is the case, he paints quickly the energy flowing through him. Sometimes, the result looks like the formulas that can be found in seismographs studies, while other times Schlammpeitziger translates the invisible vibrations that flow through him. Suddenly, new alphabets and constellations of parallel worlds baring names like Wuthaltebucht and Hydraulicmeistershalbtagstanz are the results of Schlammpeitziger’s efforts. These artworks are the antithesis to the mundane reality of daily life. Just a year after the release of Schlammpeitziger’s fourth album Spacerokkmountainrutschquartier in 1997, Jo Zimmermann and F.X. Randomiz’s new musical vehicle Holosud released their debut album Fijnewas Afpompen. This was the first of two projects that Jo Zimmermann was involved with. The second came later in his career. Two years later, in 2001, Schlammpeitziger released Collected Simplesongs Of My Temporary Past which was a compilation of music from that covered the first decade of his career. Collected Simplesongs Of My Temporary Past was released in America, Britain and Japan, and introduced Schlammpeitziger’s music to a much wider audience. For many music fans outside of Germany, this was their introduction to Schlammpeitziger. They had some catching up to do before Schlammpeitziger returned with his next studio album. This was Everything Without All Inclusive, which was the released by Sonig in conjunction with A-Musik, which had been Schlammpeitziger’s home since his third album Freundlichbaracudamelodieliedgut in 1996. However, Everything Without All Inclusive was Schlammpeitziger’s swan-song for A-Musik, and he bowed out in style with an album that fused electronic, experimental and synth pop. The other album Jo Zimmermann released during 2003 was the debut album from a new musical collective, Electrosold Collectif. They released their debut album Les Insectes in 2003, with their sophomore album The Radio Panink Sessions following in 2004. This was the last album that Electrosold Collectif released, and after this, Jo Zimmermann dawned his Schlammpeitziger moniker once again. Now signed to Sonig, five years passed before Schlammpeitziger released what was an ambitious, genre-melting album Schwingstelle Für Rauschabzug in 2008. It was hailed as one of the finest albums of Schlammpeitziger’s career, and marked the start of a new era for the maverick musician. Another three years passed before Schlammpeitziger returned with his ninth album Vorausschauende Bebauung was released on Sonig in 2011. It found Schlammpeitziger picking up where he left off on Schwingstelle Für Rauschabzug, as he released another album of quality music. Some critics felt that it was almost as good as its predecessor, while others felt this was one of Schlammpeitziger’s finest hours. If it was, this was a fitting way to leave the Sonig label. After another three-year wait Schlammpeitziger released his tenth album, What’s Fruit? It was his debut album for the Pingipung label, and found favour with critics and record buyers. Despite the reception of What’s Fruit, Schlammpeitziger didn’t release a second album on he Pingipung label, and instead, signed to the Hamburg-based Bureau B. 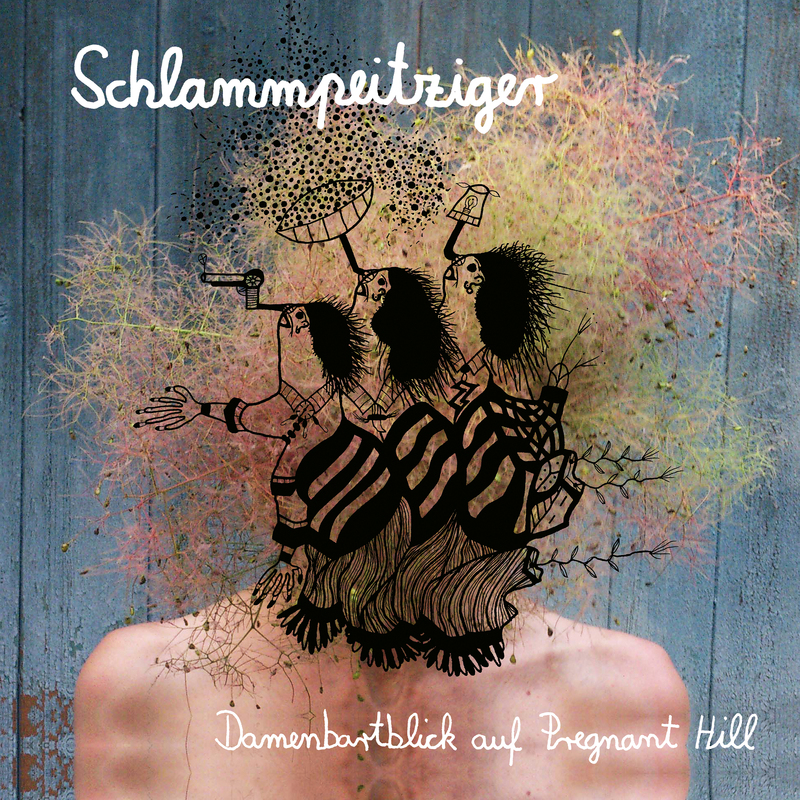 Just under four years later, and Schlammpeitziger is back with his tenth studio album, and eleventh overall, Damenbartblick auf Pregnant Hill. It’s described as the musical equivalent of a train journey, with passengers boarding and leaving during Damenbartblick auf Pregnant Hill. Schlammpeitziger watches this unfold, and documents the journey, and the people he encounters. Just a lone bass synth opens Ekirlu Kong before the sound of birds squawking is joined by synths and Schlammpeitziger’s seductive soliloquy. It sits above the melodic mid-tempo arrangement to a song that is reminiscent of the Pet Shop Boys in their prime. Meanwhile, synths, keyboards and percussion play their part in this melodic and sultry paean that sets the bar high for the rest of Damenbartblick auf Pregnant Hill. There’s an almost industrial sound to Bock Bounceburg, as synths, beep, squeak, squelch and help drive this carefully arrangement along. Sometimes, the arrangement replicates being onboard a train as the bass drum pounds. Suddenly, it’s like being aboard Kraftwerk’s Trans-Europe Express, albeit with a funky, dancefloor and irresistibly catchy soundtrack as the passengers thank their lucky stars that they eschewed journeying via the Autobahn. Damenbartblick is another memorable, melodic and dreamy fusion of electronica, synth pop and Schlammpeitziger’s unique brand of funk. It’s a potent and sometimes futuristic combination as handclaps combine with crisp beats and a bass synth that has been honed and tamed, meaning it sits lower in the mix. This allows more room for the rest of Schlammpeitziger’s sonic palette, as the music veers between mesmeric, lysergic, dreamy, futuristic and funky. Despite the music sometimes becoming mesmeric, there’s some a balletic and elegant sound to what’s one of Schlammpeitziger’s finest tracks on Damenbartblick auf Pregnant Hill. Straight away, Smooth Motion Kaukraut is reminiscent of some of the music being made in Germany during the seventies and eighties. It wasn’t just innovative, but influential and soon, artists all over Europe had been inspired by the music. Here Schlammpeitziger pays homage to Germany’s musical past, and gives it a new twist during a carefully crafted, slick and melodic track that combines the music of the past with the music of 2018. Compared to the previous track, there’s a hesitancy to Kandierter Jammerlochlappen which gradually takes shape. It’s as if Schlammpeitziger is toying with the listener, before a futuristic, moderne sometimes hypnotic and even rocky sounding track unfolds. It’s full of subtleties and surprises as the track takes a series of twists and turns, as Schlammpeitziger throws the occasional curveball. What follows is a track that isn’t just funky and futuristic, but also has a balletic and melodic sound that is truly irresistible. Filters are applied to the drums that provide the heartbeat to Angerrestbay before handclaps, buzzing synth, keyboards and searing rocky guitar are added. Nothing is quite as it seems, with effects transforming the dry signal and the instruments taking on a new sounds. That is apart from Schlammpeitziger’s soliloquy. He’s no diplomat, and his delivery is deadpan and fiery as he tells it like it is, sparing nobody’s feelings. Meanwhile, layers of music unfold, with synths and keyboards being joined later, by a funky and rocky guitar. Still effects are deployed, and part of the arrangement is panned which proves effective. By then, Schlammpeitziger’s soliloquy and his fusion of electronica, funk, rock and synth pop proves to be a successful and catchy combination. Wasserstopf is full of sci-fi sounds, beeps and squeaks before an eerie, vocoded vocal and dubby sound are added later. By then, futuristic and otherworldly describes Wasserstopf. So too does cinematic, lysergic and mesmeric as Schlammpeitziger paints pictures that are rich in imagery during this innovative soundscape. Just a bass synth plays as What I Got closes Damenbartblick auf Pregnant Hill. The dark, deliberate bass synth is joined by a glacial synth before beeps, squeaks and percussive sounds combine. They provide the backdrop to Schlammpeitziger’s soliloquy as keyboards, synths and drums provide the backdrop as the lyrics are tinged with humour, and verge on the surreal. However, the arrangement has been carefully crafted and once again, showcase Schlammpeitziger’s considerable talents. After a journey where Schlammpeitziger’s train stops at eight stations, the musical maverick’s eleventh album Damenbartblick auf Pregnant Hill is over. It will be released by Bureau B on the “19th” of January 2018, and marks the welcome return of Schlammpeitziger. He marks his return with what’s the finest album of his three decade career Damenbartblick auf Pregnant Hill. That is no exaggeration. Damenbartblick auf Pregnant Hill is without doubt Schlammpeitziger’s finest hour, and finds him fusing elements of avant-garde with the Berlin School, electronica, experimental, funk, industrial, Krautrock, new wave, rock and synth pop. It’s an album that has been influenced by German music’s past, and also by a myriad of disparate musical genres. They play their part in an album that veers between cinematic and futuristic, to hook-laden, funky and irresistible album from Schlammpeitziger. He reaches new heights on Damenbartblick auf Pregnant Hill which his a carefully crafted, genre-melting and career-defining album from Schlammpeitziger. Tagged: Augenwischwaldmoppgeflöte, Bureau B, Collected Simplesongs Of My Temporary Past, Damenbartblick auf Pregnant Hill, Electrosold Collectif, Erdrauchharnschleck, Everything Without All Inclusive, Freundlichbaracudamelodieliedgut, Holosud, Jo Zimmermann, Schlammpeitziger, Schwingstelle Für Rauschabzug, Spacerokkmountainrutschquartier, Vorausschauende Bebauung, What's Fruit?